In this beautiful Valentines Craft, children create a banner of hearts as they learn about 1 Corinthians 13, the “Description of Love”. 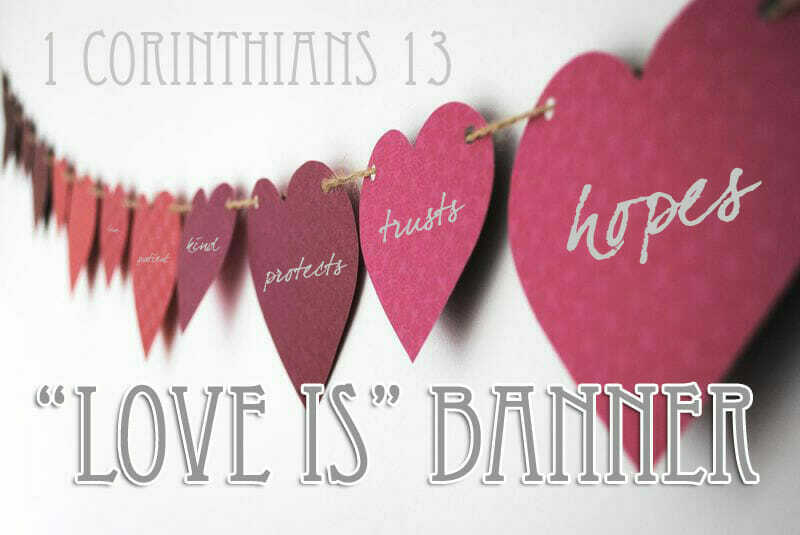 Each hear on the banner represents 1 of the 16 characteristics of love listed in 1 Corinthians 3-8. 1. Create a heart template, about 4″ wide x 4″ high. To save time, you can either trace, or trace and cut out a lot of hearts on the red construction paper. Each child will need 16. 2. Create a second heart template, maybe 6″ wide x 6″ high. 1. Trace 16 hearts using the smaller stencil and cut them out. Punch 1 hole in each corner of the heart the string the ribbon through. 2. Write one of the descriptions of love on each heart. 3. Trace the bigger heart just once and cut it out. 5. Begin by stringing 3 smaller hearts, and then string the big heart after the THIRD little heart, starting from the left. Continue on and string the remaining 13 little hearts. 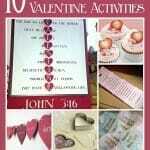 You might also be interested in these other awesome Valentines Craft and activity ideas! Love this idea! Very sweet. 🙂 Featuring you this weekend in Sunday Features! This is so cute! What a great, thought provoking craft. Love it! Thanks so much for linking up with the Great Blog Train last month. I hope you’ll join us again this month! I absolutely love this DIY Valentine’s Day Banner! 😉 Thank you for linking up to the Oh My Heartsie Girls Wordless Wednesday Linky Party! Love this garland! 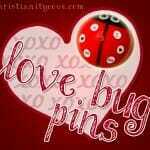 Thanks for sharing at The Pin Junkie! It’s part of today’s Valentine craft roundup! I will feature this tomorrow at HSH! Great idea to use the verse on the hearts! Thank you for joining Home Sweet Home. Thank You So Much for Sharing !!! 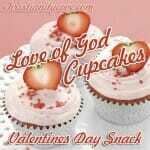 I Will Pin to Share and Will Try This Valentines !!! Beautiful! Perfect verse for all years but especially the holiday of love. Thanks for linking up to Snickerdoodle Sunday. I LOVE this so much! pinned and tweeted! what a brilliant idea! Thanks for linking up at Totally Terrific Tuesday! Thank you for linking up with us at Grace & Truth. This is something I’ll definitely be coming back to as we get closer to Valentine’s day. I love that passage from Scripture. I really love this one! I’m gonna pin it! This would be a great craft for the kids. It would look great hung across our fireplace. I’ll be featuring this over at the Thoughtful Spot on Monday. Thx for sharing!! This is great! I think this is amazing to do with my Sunday School Class. Thanks for linking up to Totally Terrific Tuesday. Cute banner idea! Great post (: Found you via Shabby Nest Link up Party! This is so cute! I love the focus too…thanks for sharing! Love this post! Such a great craft and way to get the kids involved. I featured you and this post on this weeks TGIF Blog & Instagram Hop. This is great! I love I Cor 13! I’m thinking it would be a great project for my girls or students. Reflecting on kindness and love and what it means to them. What a fabulous reminder of what Godly love looks like! Thanks for linking up with the Faith and Fellowship Blog Hop! Love this so much! 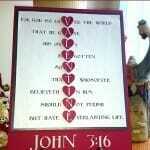 Last year for our homeschool Valentine’s party I did a devotion on this verse. This year I’m going to make this to have hanging in our home. Thanks for sharing! This is such a beautiful and simple craft for Valentines Day! Love it! Thanks for linking up at OMHG WW this week! This is a perfect project to do with these foam hearts I picked up last year!! Thanks for sharing. I just love this and so perfect to hang year round!! A nice reminder for the atmosphere in your home. Pinned! This is truly beautiful! Thanks for an inspired lesson and craft! Beautiful to look at and a great teaching tool as well! Thanks for sharing with SYC. This is beautiful! 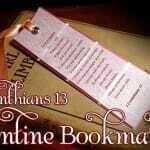 I made a Valentine’s banner, but I especially love the scriptural basis. Thank you – beautiful in more ways than one. I love this! It is so simply and yet perfect for learning what love is truly about. Thank you for sharing. I stopped by from momstheword making your home sing Monday Link-up. I love this! I think this would look so pretty strung across the headboard of the bed- I think I will make! Plus, what a great hands-on way for kiddos to learn this verse. I love this! Great job! The picture turned out awesome! This is so wonderful! Love the easy idea behind the project and the meaning. Thanks for sharing on Sunday FUNday! I was actually going to sit down and brainstorm what I what all I wanted to do with my kids for Valentines Day this year— Love the banner! We will be making! 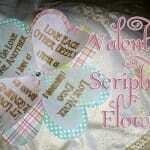 I love the way you used the heart banner to illustrate a wonderful scripture. I’m going to share it with our children’s ministry. I simply love your banner.The verse is one of my favorites, and you did a beautiful job. I would love if you would stop by and link this up to my blog party, “Celebrate It”! It is all about celebrating the everyday wonderful of our lives. I absolutely love this! It’s such a brilliant way to learn the scriptures… easy AND hands on. I’ll definitely be doing this! Love how this is a visual and hands-on way to memorize this verse. Pinned. Thanks! I LOVE this idea! Thanks for linking up at A Little Bird Told Me Linky Party! This is so sweet. It’s a lovely, creative idea. I saw this at the Creative Inspirations party. I just love this idea! I’m visiting from the Thursday Favorite Things blog hop. I also wanted to invite you to the Great Blog Train (blog hop) – we are traveling to GREECE this month! What a beautiful idea — I like it! 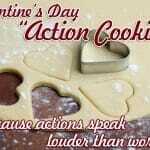 I love this and I’ve been thinking of doing something similar leading up to Valentine’s Day. Pinning to my Deliberate Valentine’s board. I like this idea. 1 Cor. is an awesome passage! I LOVE this idea! I’m going to be making one for my home. Supppper cute!! I’m actually on my way to get supplies for a banner– I may have to change my plan and do this one instead! Love it, one of my favorite verses!